Many retired individuals fail to give much thought to what they really want to do after retirement. For example, you may have spent your youth dreaming about your post-retirement plans but now feel unsure about how to spend your time and your money. First, give some serious thought to your interests and passions — then plan accordingly. Maybe you love golfing — a hobby that can get expensive. Rather than taking money directly from your retirement account without a second thought, consider making cutbacks in other areas to account for expenses like golf clubs and golf club membership fees. The point is, enjoy your life after retirement — just make sure you can afford to do so! Don’t use retirement as an excuse to spend excessively. It is easy to overindulge when it comes to personal spending. After all, you worked hard for your money and should be able to enjoy it, right? Yes, you should — but that doesn’t mean you should throw caution to the wind when it comes to shopping, or stop adding to your savings account. Trimming expenses wherever possible then putting the money saved in an interest-earning account can serve you well even after retirement — never stop saving! If the money you’ve saved is enough to live on for a while but leaves nothing for your beneficiaries, you may want to consider a working retirement. Another reason to work during your retirement years is if your savings simply isn’t enough to live comfortably on. Most people expect a consistent return of 10 percent, which is only $20,000 a year based on a lump sum of $200,000. Some people can live off that much, others cannot. Working after retirement can not only improve your standard of living but also keep you active and social. Although it is recommended to start investing wisely as early as possible, it is never too late. 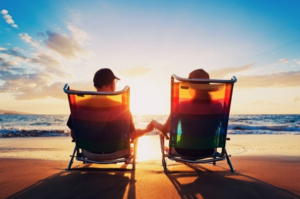 Even after retirement, you can still benefit from IRA tax shelters. In today’s economy, the wisest choice when it comes to an IRA is often a gold IRA – for a multitude of reasons. When the dollar’s value drops, investors with dollar-based investments will lose money. However, those who have gold investments will be just fine because gold retains its global value even in the face of economic collapse. By choosing a gold IRA, you get the benefits of this investment vehicle, backed by a tangible, highly liquid commodity. Even if you follow none of the other financial tips in this article, you can still come out on top by choosing a gold IRA. As previously mentioned, the sooner you start, the better — but it’s never too late!